There are a lot of great things about working as a college Admissions Counselor. We get to talk to excited high school students about their plans for the future, ease the fears of parents who are preparing to let their children leave the home and start on their journey towards adulthood, and inform high school guidance counselors about what makes St. John’s College unique. There is a lot of traveling that goes into these conversations—we can’t expect everyone to come to us, so we all spend between 8 and 12 weeks on the road visiting high schools and presenting at college fairs. Traveling is fun, but it can also be a bit tough to be away from home that much. Other professionals in this industry recommend that you do things on the road to remind you of home. For some that means bringing a family photo in their suitcase or establishing a routine in your hotel room that mimics your routine at home. For me, I find that searching for things that remind of St. John’s is a very satisfying way to renew my connection to the place that will forever be my favorite home since I first set foot on campus at the beginning of my freshman year. When I see these random things that make my inner Johnnie squeal with delight, I can’t help but take a picture. I have photos of street signs bearing every name from St. John’s and Euclid to Homer and Goethe from cities all over the Midwest and California. I’ve collected pictures of signage from Dante’s Pizza to advertisements for a display of Galileo’s astronomical images at a museum. 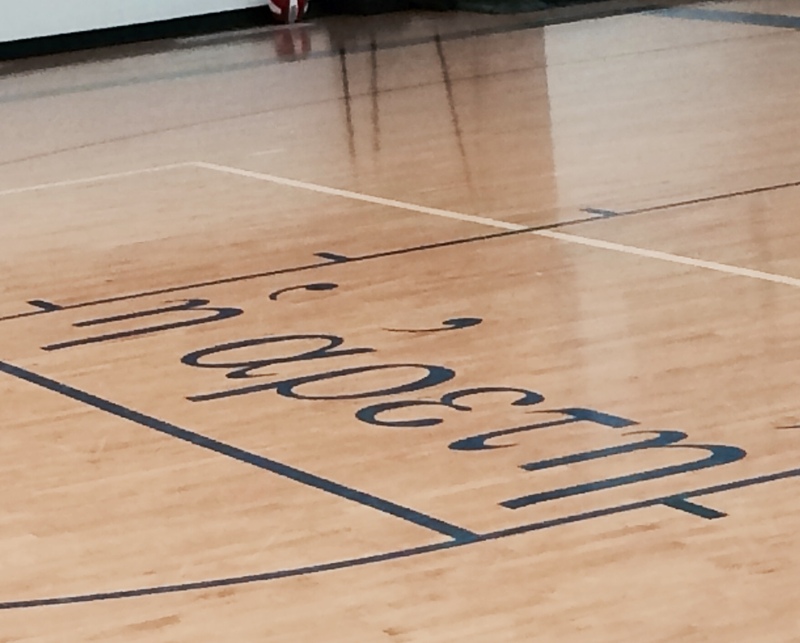 But I have to admit that I actually squealed out loud when I walked into a high school gym in St. Louis to see that they have their school motto written in Ancient Greek on the floor of their gymnasium. Since most of you reading this probably haven’t studied Ancient Greek (yet! ), Aretḗ is the Greek word for excellence in any form, so it takes on a variety of meanings in translation—skill, valor, virtue and goodness, just to name a few examples. Seeing this not only gave me a temporary link to home, campus and the academic program which allowed me to fall in love with St. John’s College, but it also reminded me that no matter which translation you use for aretḗ it is a word that accurately describes our students. It requires both skill and valor to undertake our academic program, as it certainly isn’t easy to do what Johnnies do. We as Admissions Counselors invite you to explore the opportunities that St. John’s has for students. If you let it, this college, this program and these people who choose to do it will help you uncover your most excellent—most skillful, bravest and virtuous—version of yourself. And you will find that while you may not have a gym floor to print it on, aretḗ may become your motto in life as well.